I have been trying to make chapattis (an Indian flat unleavened bread, somewhat like a wheat tortilla), using the following recipe for the dough: 300ml water, 250g whole wheat flour, 250g white wheat flour, pinch of salt. The dough rolls out fine, but the cooked chapattis turn out rather hard and/or rubbery instead of nice and soft. Any ideas why, and what I can do to improve the result? Yogurt and milk might work, but those ingredients are not in authentic chapati. When I hear the words "hard" and "rubbery" in reference to pan-fried bread, I'm almost certain that the problem is that they are cooking for too long on too low of heat. Increase the heat on your pan (it should be very hot) and cook the chapati very briefly on each side. This will still give them a nicely browned exterior, without turning them into sheets of rubber. This creates layers. 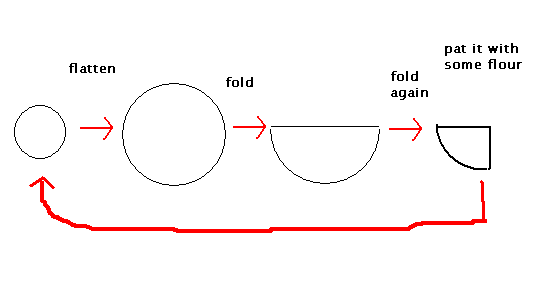 Use a bit of ghee/pure ghee while folding. If you do this once or twice it and if the chapati is thin enough (2mm-3mm) it puffs up into a fluffy ball when you put it on the flame/pan. Oh well, I make chapatis everyday, even when I bake a Pizza or a cake. The dough for making chapatis and stuffed and plain parantha and even poori is same. Until and unless you are trying some thing fancy like bhature you just need water and wheat flour. As I am used to kneading dough w/out any measurement I cant suggest you measurements. I knead the dough till the time its firm enough to stand in a round shape. More over I take a ball of dough and throw it on granite counter with some force it doesn't loose its shape. Now the temperature of griddle matters a lot. I keep it on a medium heat for chapatis and high for paranthas. Roll out a chapati and place it on preheated griddle. You may need some flour while rolling out the chapati. Leave it on griddle for 10-15 seconds. Turn the side and leave for another 15-20 seconds. Turn side third time and you should see the chapati puffing up with steam. With this dough you can make chapatis, plain paranthas, stuffed paranthas and poori. On a very special occasion my Mom used to knead the dough with milk and or ghee, a kind of clarified butter. Dough kneaded using milk and ghee is normally used for purees. One trick is to add a small amount of oil while kneading the dough. It makes the chapattis nice and soft. Also, the more you knead the dough, the better the chapattis. I don't know that unleavened bread is ever going to be super-soft, but are you simply cooking in a griddle as in the recipe Pointy linked? You can get them to really puff up if you expose them to direct heat. I'd try using two burners, one with a pan as before and one simply bare and over medium-high heat (experiment on this). After you brown both sides, use tongs to put the chapati directly on the burner -- it will inflate almost instantly, after which you can remove it from the fire. I've gotten quite good texture with this method. I've been taught to roll them out three times. Roll out, spread with vegetable oil, fold into a bun, let rest while you do the same to the rest, then roll out again, spread with oil, fold back into bun, let rest. The last time you roll it out it is ready. Put in a medium-hot pan with oil and never let it sit. Keep spinning it with your fingers. Turn over and remove from the fire. Adding some oil while preparing dough. And leave it for half an hour. To get a softer and tastier chappathi. Adding to the other answers, leave it for an hour or so, wrapped in a moist cloth. This would enhance the gluten formation. Its all about how you add/maintain/remove moisture during the whole process of making a chapati. I am not sure how anyone can measure the amount of water for the dough. Use a little oil while kneading the dough, and add as much water as possible without losing the consistency you want. Also, leave the freshly kneaded dough to settle for sometime (~15mins) by sprinkling some water all over the dough and cover it. The kneaded dough will absorb much more water during this time. Once you have the rolled chapati off the tava, place it in a covered container/box. Not the answer you're looking for? Browse other questions tagged bread indian-cuisine or ask your own question. New bread maker asks: how to make a bread loaf stay 'firm and solid' without a loaf pan?